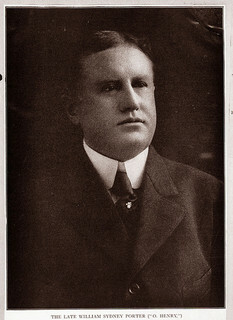 The O. Henry Festival, held annually in Greensboro in April, was founded in 1985 to commemorate the life and works of native son William Sydney Porter (1862-1910), who became world famous for writing short stories under the pen name O. Henry. Porter's gentle and ironic stories, often ending with a surprise that has become known throughout the world as an "O. Henry ending," remain favorites that are still anthologized today. As the seventy-fifth anniversary of Porter's death neared, Marvin L. Skaggs, a retired Greensboro College history professor, convinced a group of citizens of the community that the city needed a visual link to its great writer. A steering committee, spearheaded by Seth C. Macon, a senior vice president at Jefferson-Pilot Insurance, and Bruce B. Stewart, provost of Guilford College, broadened the idea for a sculpture into what eventually became a week-long festival in April. During the first festival, a sculpture designed by Maria Kirby Smith, who had been awarded the commission following a national competition, was unveiled in downtown Greensboro. It stands on North Elm Street across from the site where the O. Henry Hotel stood until it was demolished in 1979, one block from the Greensboro Historical Museum. The completed sculpture, in three parts, depicts a 7½-foot-high open book with a readable copy of one of O. Henry's most famous stories, "The Ransom of Red Chief," as well as a bas-relief sculpted picture of the couple from another famous story, "The Gift of the Magi," in their New York City flat. Nearby a small boy peeps from behind the book; a free-standing sculpture of a dog, based on an illustration from another well-known O. Henry story, "Memoirs of a Yellow Dog," stands nearby. To the side stands a life-size sculpture of O. Henry himself, modeled on a photograph of Porter, holding an open notebook in one hand and a pencil in the other. In addition to the sculpture unveiling, the 1985 festival included expansion of the O. Henry exhibit at the Greensboro Historical Museum. The permanent exhibit incorporates part of the downtown Greensboro drugstore in which Porter worked as a young man, as well as a schoolroom that was part of the schoolhouse his aunt Lina Porter operated and where the young Porter was educated. In addition, an original musical drama by Joseph Hoesl, based on O. Henry's works, was premiered by the Community Theatre of Greensboro; a special exhibit, "O. Henry Replayed," at the Greensboro Public Library displayed original manuscripts, first editions, and films; and a memorabilia exhibit was shown at Brock Museum at Greensboro College. The week-long festival ended with a gala that included an original work by the Frank Holder Dance Company and a pops concert by the Greensboro Symphony. Most of the festival events are sited at Greensboro College, now the official home of the festival, although the Greensboro Historical Museum continues to present "5 by O. Henry," a series of dramatic sketches, every other year around Porter's birthday (11 September). Abe D. Jones Jr., "An O. Henry Extravaganza" and "Greensboro Honors a Very Private Man," Greensboro News and Record, 31 Mar. 1985. Seth C. Macon, From the Boiler Room to the Board Room (1996).